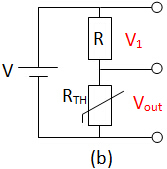 Transducers are devices that transform energy from one form to another. They are used in control systems, instrumentation and electronic communications. Input transducers are transducers that change non-electrical energy to electrical energy. A thermistor is a device that has a resistance changes with temperature. When temperature increases, the resistance of thermistor decreases. Therefore, it can be used for temperature control. When temperature rises, what happen to Vout? 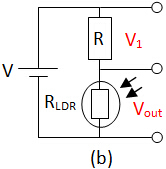 V1 increases as V1 = IR and R is a fixed resistor. It could be used to activate a fire alarm, if Vout rises above a certain threshold value. 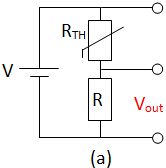 It could be used to switch on a heater, if Vout fall below a certain threshold value. 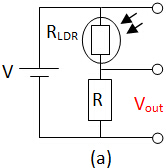 LDR is a device that has a resistance changes with light intensity (amount of light) shining on it. When light intensity increases, its resistance decreases. When light intensity rises, what happen to Vout? It could be used to activate a burglar alarm, if Vout rises above a certain threshold value. It could be used to switch on the street lamp, if Vout fall below a certain threshold value.